Scientists studying the rare and unusual kakapo have turned to crowdfunding to back a push to sequence the DNA of the remaining 125 birds. A campaign launched on experiment.com hopes to raise NZD$68,000 to fund genome sequencing for the nocturnal parrot. The entire project would clock in at $100,000, but with $35,500 already funded sequencing has begun on the first 40 genomes. Department of Conservation scientist Dr Andrew Digby works on the kakapo and takahe projects and says, if funded, the “dream project” could provide stacks of data to help manage the birds. The team said having the genomic information of all 125 kakapo would help understand relatedness between the birds to optimise breeding plans. Genome sequencing of one bird, conducted by Jason Howard at Duke University, allows the remaining birds’ genomes to be sequenced easier and quicker. Digby said Howard was refining the sequenced genome which should provide one of the highest resolution bird genomes thus far. “When I heard about that work going one I thought it would be great to genome sequence all the birds,” Digby said. 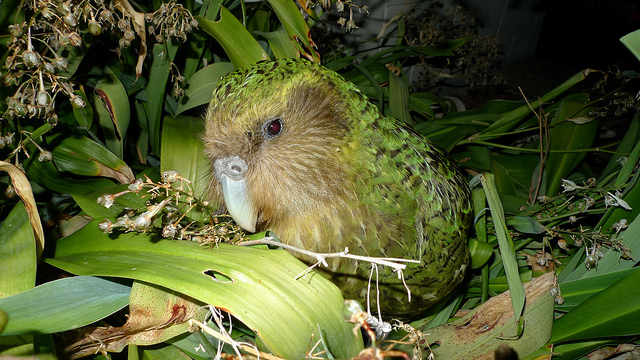 A second fundraising stream allows backers to fund a given kakapo’s genome sequencing. The Kakapo Recovery team are in the midst of what looks to be the busiest kakapo breeding season yet, with Anchor Island exceeding expectations. Digby said that extra activity would eat up a lot of the budget, so the programme needed to look for other ways to fund its work. With only 125 birds left, kakapo are classified as “critically endangered”. Birds on Anchor Island and Whenua Hou/Codfish Island are in the middle of a mating season which scientists hope will result in another influx of chicks. Most exciting would be if a certain female’s – Kuia – eggs turned out to be fertile, as she is the only female kakapo with rare Fiordland genes (inherited from her father, Richard Henry, the last surviving Fiordland kakapo). Digby said Richard Henry and one of his offspring – Gulliver – had different MHC (major histocompatibility complex) genes than the Stewart Island birds. MHC genes are linked to the immune system, so Digby said better understanding that genetic variation could be important if a novel pathogen struck the population in the future. There are other conditions afflicting the rare parrot that might be better understood with genetic information, Digby said, such as infertility, hatching failure and cloacitis (“crusty bum” – an infection that does what it says on the box). He said at least one bird, but possibly more, had died of cloacitis. The researchers hope genomic information across all the birds would help the breeding programme by better understanding the relatedness between birds. On Friday, the recovery team will be on Whenua Hou working on an artificial insemination programme. Digby said mates are chosen based on genetic information, so better quality data will better inform the programme. Digby said the idea to crowdfund came out of discussions with David Iorns, founder of the Genetic Research Foundation and ex-pat Kiwi. With an estimated cost of $100,000, Digby said the recovery programme spends “a lot more than that every year on management of the birds”. They had not searched for alternative funding, but with money for conservation tight, and especially with resources being poured into a busy breeding season, looking to crowdfunding could provide a much-needed chance to put funds into long-term projects such as genomic sequencing. Featured image: Sirocco, Maud Island. Chris Birmingham.